Even if you’ve never heard one, you probably know that their characteristic roar. However, lions also make a variety of other sounds and vocalizations including calls that we refer to as caroling. Now before you start picturing a lion choir, caroling is a lot less melodic than the Christmas carols we hear at this time of year. For lions, caroling is the biggest noise they can make. They use their diaphragm to force the sound out and the resulting roar can travel for miles around. Lions carol for a few reasons, both inside the pride and to outsiders. Males carol to communicate to other, roaming males that may be passing their territory, to warn them to stay away. Members of the same pride also carol to communicate to each other while hunting, when they may be some distance away from each other. “Lions have a unique voice,” says Bednarz, “so when they carol they can actually tell each other apart.” They can even recognize how many voices are caroling, so approaching males will judge by the number of competitors whether they want to challenge them or steer clear. 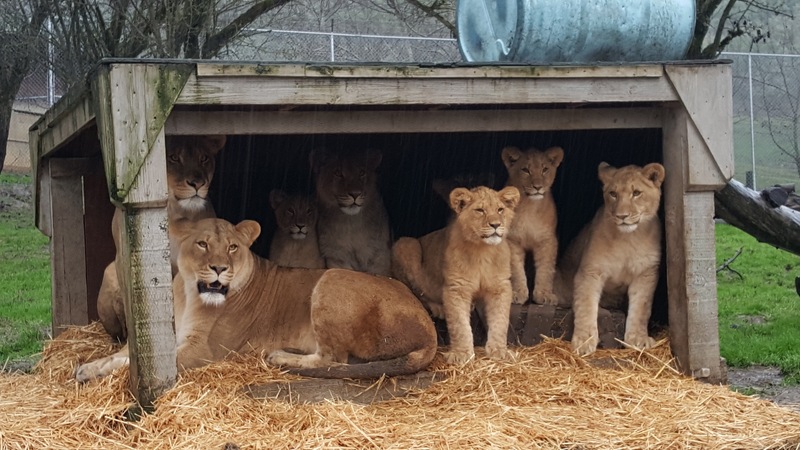 Wildlife Safari’s lion pride has ten voices to join in with caroling this year, with two litters of cubs (two 10-month old cubs and four 6-month old cubs). Jordan Berdnarz, Lead Carnivore Keeper and Primary Trainer for the adult lions, has been with these particular lions since they first came to the park. 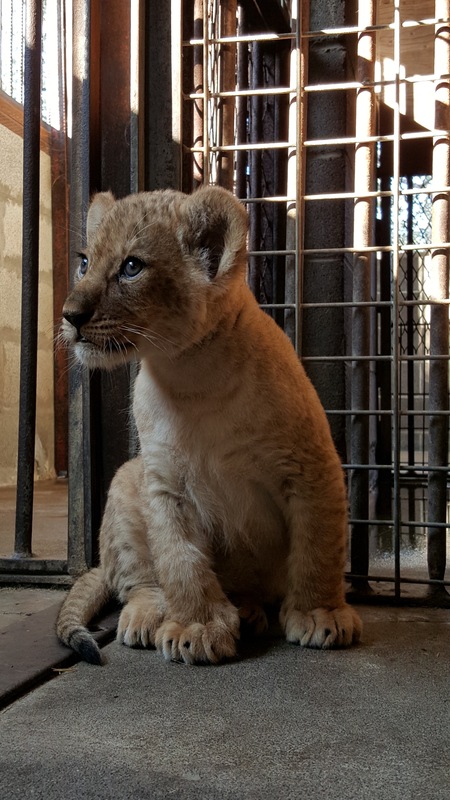 Bednarz says these cubs are important for a variety of reasons, firstly, because they are extremely genetically valuable for conservation purposes within the captive population. 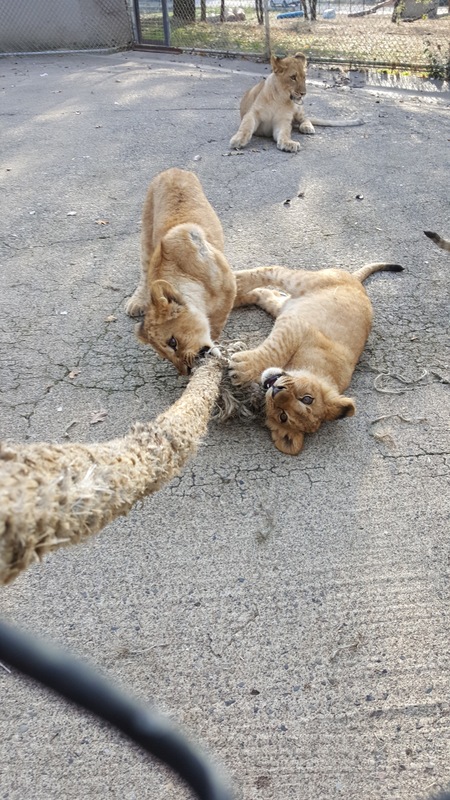 Closer to home, though, these cubs are tremendously important to Wildlife Safari as our first lion cubs born in 23 years. “These litters are really special to us,” says Bednarz. As Christmas approaches, keepers wait in anticipation of giving our lion pride some wonderful holiday themed enrichment… Christmas trees! After Christmas, as the decorations start coming down, Wildlife Safari accepts donated Christmas trees which we give to our animals. All across the park the animals love these strange, tall toys. “Our lions absolutely love them!” Says Bednarz. “Especially our males.” Even old trees that are long past their prime are much enjoyed by the lions all year long, and as the cub’s first Christmas, keepers eagerly await their reaction to their first Christmas tree! So if you feel like you need an extra boost of Christmas cheer, come visit and see our caroling pride get into the Christmas spirit!